How do you make a gripper for a robotic arm without using electric pinchers or a pneumatic vacuum cup system? You look to nature, for starters. 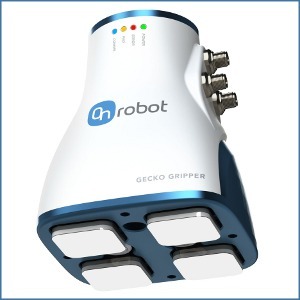 End-effector tooling specialist OnRobot is now taking orders for its Gecko Gripper, which uses millions of micro-scaled fibrillar stalks that adhere to a surface using powerful van der Waals forces -- the same way that geckos climb. The technology was first developed at Stanford and perfected by NASA's Jet Propulsion Lab. The Gecko Gripper is on display for the first time this week at the ATX West show in Anaheim, CA (where OnRobot is co-exhibiting with Futura Automation). It lets robots pick up flat, smooth objects with significant energy savings over existing grippers such as vacuum grippers, which require compressed air that is costly, power intensive, and bulky. This gripper interfaces with any type of robot. According to OnRobot, it can pay for itself in eight months in cost savings for electricity used to compress air alone. The Gecko Gripper can affix to a wide range of surfaces, including fragile items that vacuum grippers can't handle, and it also offers competitive advantages over electrostatic grippers, which are weaker and require high-voltage systems to operate. "The market reaction to the Gecko Gripper has been extremely positive," says Kristian Hulgard, OnRobot's general manager for Americas. "We see the gripper now challenging traditional application and material-handling design in a wide range of delicate tasks such as picking up porous and fragile objects like PCB boards." This is especially important because the Gecko Gripper excels at picking up objects with holes that vacuum grippers cannot address, because they lose suction when air passes through openings in the object. Grip strength depends on the material being handled. For best results, the material should be dry. 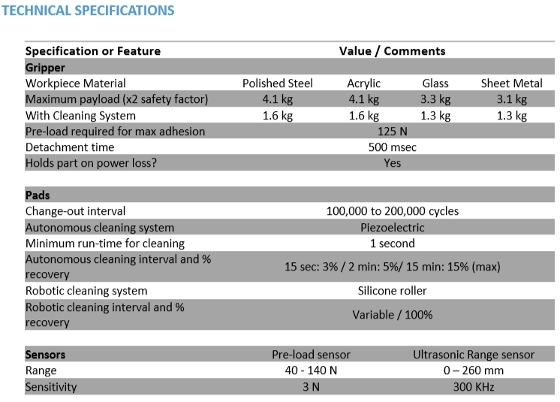 A spec sheet for the Gecko Gripper lists the maximum payload for polished steel and acrylic to be 4.1 kg; glass is 3.3 kg, and sheet metal is 3.1 kg. Detachment time is 500 msec. But wait ... how does it work? Well, it's kind of like Velcro -- if you only needed one side of the Velcro tape. OK, this is the neat part. We saved the best for last. Each rubber gripper pad has millions of little "gripper" hairs on its surface. You can't see them, and the pad looks like a regular piece of rubber. It feels like regular rubber too. The rubber pads, themselves, are not "sticky." However, the fibers (or hairs) all align in one direction on a single pad. Two pads with opposing-direction fibers make a simple gripper when the pads are pushed down on the object and then moved slightly toward each other. The van der Waals forces (weak, short-range electrostatic attractive forces between uncharged molecules) at the microscale create an adhesive effect when the fibers are pushed down (loaded) and the majority of their surface area makes contact. Perception Robotics put it this way: "By arranging these pads in counterbalanced pairs, triads, or quads, omni-directional grip can be achieved." To release, just move the two (or more) pads slightly apart. That's it! No pneumatics. No high-voltage electric. Let's take a look at this early-development video from NASA so we can see what's happening. The OnRobot Gecko Grippers have some extra features, like an integrated load sensor for precise gripping and a proximity sensor for part presence. Those certainly make it competitive. Another is an autonomous self-cleaning function for the pads that can be added. As mentioned, the pads are not sticky, but they can get dirty or dusty from all that pick-and-place action. For NASA, the applications for such an uncomplicated catch-and-release technology are many and have been studied in earnest for a few years. Back here on Earth, the new grip tech is just getting started -- and OnRobot is the first to get a real handle on it for commercial applications. Learn more at OnRobot here.